Chief of European Theater section of General Staff and a distinguished strategist. He was no West Pointer, but a graduate of Miami (Ohio) University. He became an Army careerist in World War I. In World War II, as a Brigadier General, he shared with General Thomas Handy, direction of the Operations Div (OPI), which virtually ran Army affairs. Later, as a 4-star General, was Supreme Commander, Far East. Extremely modest "Ed" Hull was highly popular with his fellow soldiers. Born at Greenfield, Ohio, May 26, 1895. He was commissioned a Second Lieutenant, Infantry, August 15, 1917, and advanced through the grades to General; permanent Brigadier General, October 1945; permanent Major General, January 24, 1948, with date of rank from July 7, 1942; Chief of Theater Group, Operations Division, General Staff, 1942-44; Assistant Chief of Staff, Operations Div, 1944-46; Plans and Operations Div, 1946; Commanding General, Army Forces Pacific, Hawaiian Dept, 1946-48; Commander of Task Force 7, (first atomic bomb weapons tests, Eniwetok), October 1947-June 1948; Commanding General, US Army in the Pacific, 1948-49; Director of Weapons Systems Evaluation Group, Office of the Secretary of Defense, Washington, DC, 1949-51; Deputy Chief of Staff for Operations-administration, Washington, DC, Jan-Aug 1951; Vice Chief of Staff, 1951-53; Commander-in-Chief, United Nations Forces, Far East, also Commander-in-Chief of the Far East and Governor of the Kyuku Islands, 1953-55. He retired from the Army in 1955, and died on June 10, 1975. He was buried in Section 7, Grave 8197-B, Arlington National Cemetery. 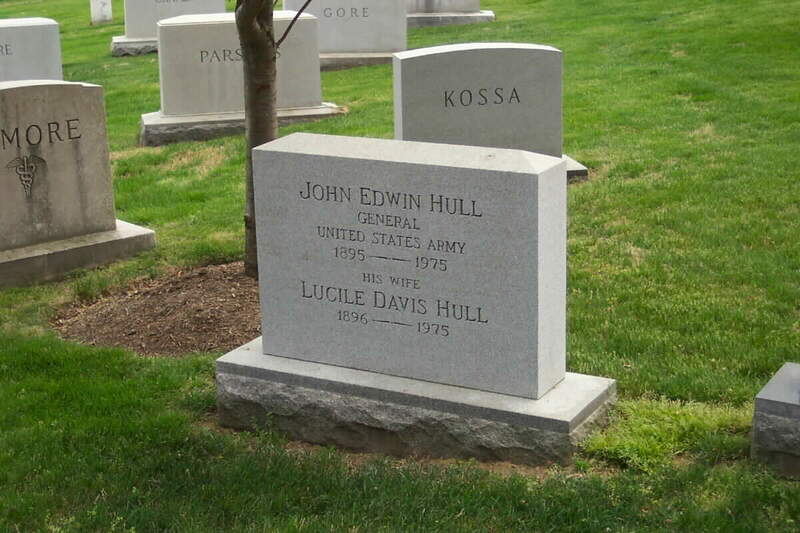 His wife, Lucille Davis Hull (1896-1975) is buried with him.